In this study, customer data from a telecommunications provider was used to illustrate how to identify purchasing relationships (which products or services are purchased together). 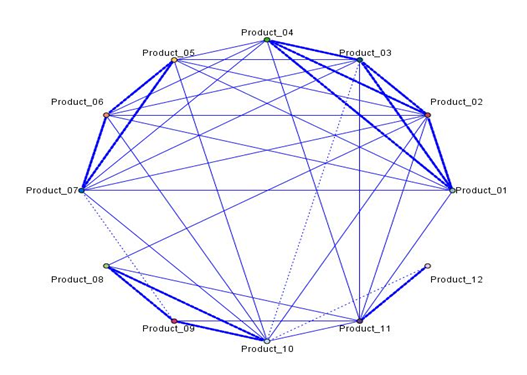 The chart on the left depicts the product groups using customer purchase data (the thickness of the lines represents the number of customers making up these relationships — products 1, 2, 3 and 4 makes-up one of these groups). Predictive models are then built using product groupings and customer behavioral and descriptive information to determine which customers will be most receptive to cross and up sell opportunities. The objective of this study is to illustrate how a company can increase revenue by using customer profiles generated by these models to predict which customers will buy a particular product within their product grouping. In addition, increased sales can result from targeting customers with cross and/or up-selling promotions that have not purchased all the products in their product group.